Codling Moth was introduced to North America by European settlers and has since become an established pest in all pear producing regions of the United States and Canada. 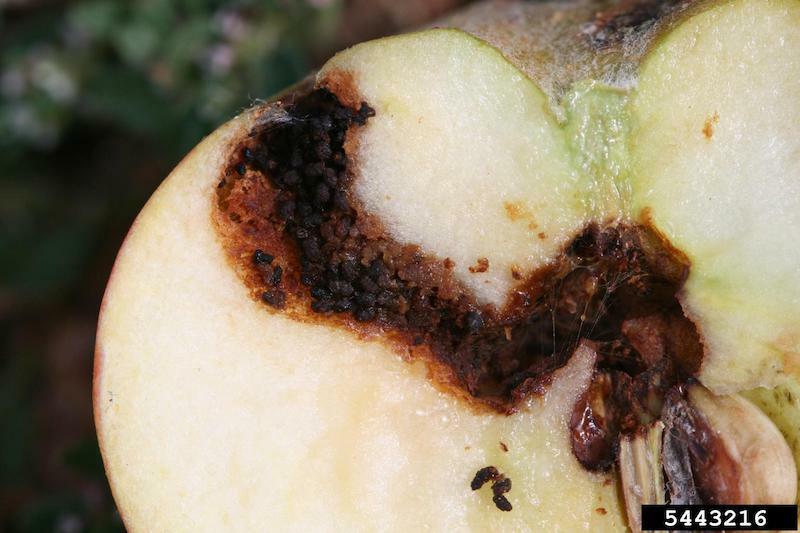 Larvae cause two types of fruit damage; deep entry, where larvae burrow down into the core of the fruit, pushing frass out as they go and shallow entry where feeding may also occur but no tunneling is present. Both forms of damage render fruit unmarketable. Second generation larvae cause the most damage. The adult codling moth is gray-brown with alternating lighter gray and white bands across the wings. 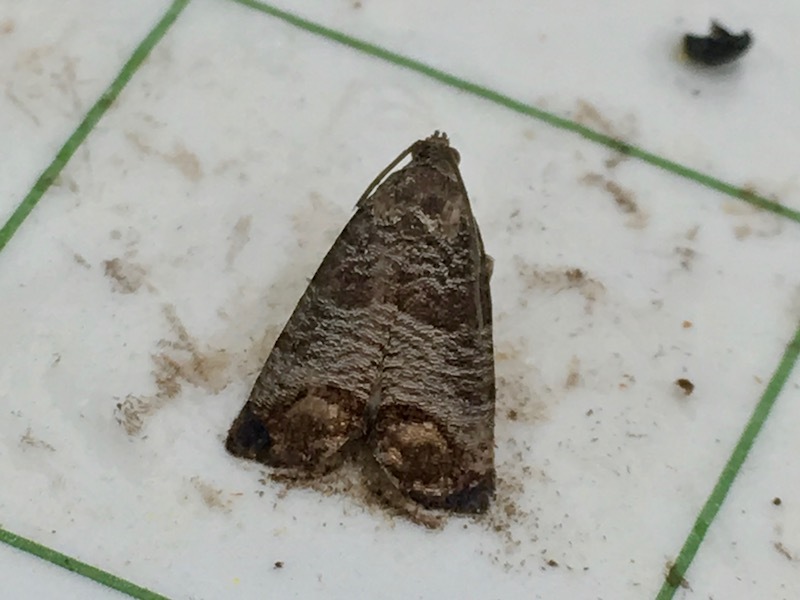 The wings are marked at the back end by a coppery area that helps distinguish codling moth from other similar moths. Newly hatched larvae are small, the black head is twice the width of its pale yellow body at this stage. Mature larvae are pinkish-white with a brown head. Codling moth overwinters as a later stage larva. Pupation occurs during bloom. First adults emerge at 150DD, base 50 ℉. when counting from January 1. Warmer spring temperatures can accelerate the growth of codling moth, leading to earlier developmental milestones (like egg laying and hatching). Females can lay up to 100 eggs. Early season eggs are generally laid on leaves whereas later generations are usually laid on fruit. There can be anywhere from one to four generations. Pheromone traps should be hung at bloom, on the north side of the tree at eye level. Hang traps in the orchard where moths are most likely to enter from alternate host sites. Check traps at least once weekly. First insecticide applications should be made ~ 250DD (base 50) after sustained catches in pheromone traps. First insecticide applications for second-generation should be made at about 1,400 DD to 1,600 DD, using the same biofix as previous spray timing. Non-Chemical Control: Remove abandoned orchards and other alternate hosts, where practicable. Trunk banding can be a useful method of reducing codling moth pressure. Cardboard wrapped around trunks before larvae move to cocooning sites will cause them to pupate on the cardboard, which is subsequently removed and destroyed prior to adult emergence. Hot water treatment of storage bins can destroy a number of the overwintering larvae. Mating disruption and Surround are also effective non-chemical control methods. Chemical control: Many insecticides are effective against codling moth when applied at the right timing and insect development stage. Resistance to organophosphates, however, has been documented in some regions of Washington and Oregon and is likely in other regions/orchards where codling moth is a problem.